ElectronicKitSchool. - Proteus 7 professional has update their version after Proteus v7.9 professional, now came with Proteus Professional v7.10 SP0 for Windows system. With shis software you can build electronic project simulation firstly before implement to real condition to know how your project will work perfectly. 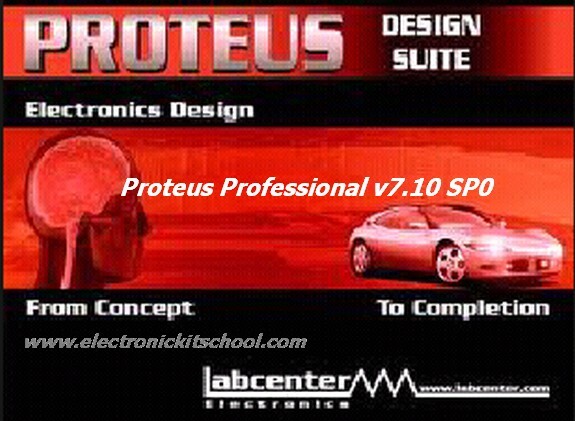 Proteus Professional v7.10 SP0 also provide the features that called with ISIS and ARES that allow you to design electronic circuit and simulate it and then you also can create PCB layout design at once using this software. In this article we will give you global overview about Proteus 7 software, the features, system requirement and the last we will give you the link that allow you to take free download Proteus Professional v7.10 SP0 for Windows with Crack and Licence Key. And we don't forget to give you guidance about how to install this software to your computer easily. We repeat again that one version of Proteus software is Proteus 7 for Windows system. It mean you can use this software in your computer or laptop which using Windows OS. In other version that Proteus also provide in other Windows like in Machintos and other. As an electronic simulation software and application, Proteus 7 has been developed by Labcenter Electronics that can be used for schematic capture, microprocessor simulation and PCB designs. In other information that Proteus 7 is the most widely used version all over the world and about 98% of the installations are currently using this version. One of the main components of Proteus 7 is Circuit Simulation which is a product that uses SPICE 3f5 analogue simulator kernel with digital simulator which allows user to use any SPICE model from any manufacturer. The application comes with extensive debugging features which includes break points and single stepping. So, the application can be used in the educational institutions in order to teach the students about circuit designing. As more information to you that Proteus 7 has a very simple and organized interface and has all the necessary tools and commands which are necessary for designing circuit boards and also for testing them. The application is strictly for the advanced users and only those who have extensive knowledge of circuit designing can use it efficiently. The features of PROTEUS software commonly as follows. Supports simulation of various types of microcontroller such as PIC, the 8051 series. Has the ability to display various kinds of analysis graphically as transient, frequency, noise, distortion, AC and DC, etc. Supports PCB manufacture are updated directly from program to program ISIS-ARES PCB maker. And now you can click the icon link below to continue download Proteus Professional v7.10 SP0 for Windows with Crack and Licence Key. There are two files that you show download.